This Bar Caddy 3 Compartments is available in black or chrome, these bar caddies can adopt one of two personas on the bar: loud and eye-catching, in the chrome or cool and understated in the black. As with all Beaumont TM products we have carefully chosen the materials to ensure that the bar caddies provide good value for money, staying pristine and undegraded through many nights of service and bar clean downs. Looking to buy some Bar Caddy & Napkin Holders? 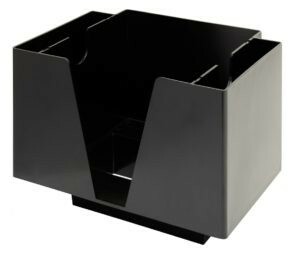 If you would like some advice on purchasing Bar Caddy & Napkin Holders, simply contact our expert sales team, giving us either an email or phone number on which to contact you and we'll get back to you with the best advice or contact us by email: [email protected] Phone: 020 8424 8886.